From the viewpoint of the passed more than 20 years I remember on the events of that cycling tour a bit differenetly now. 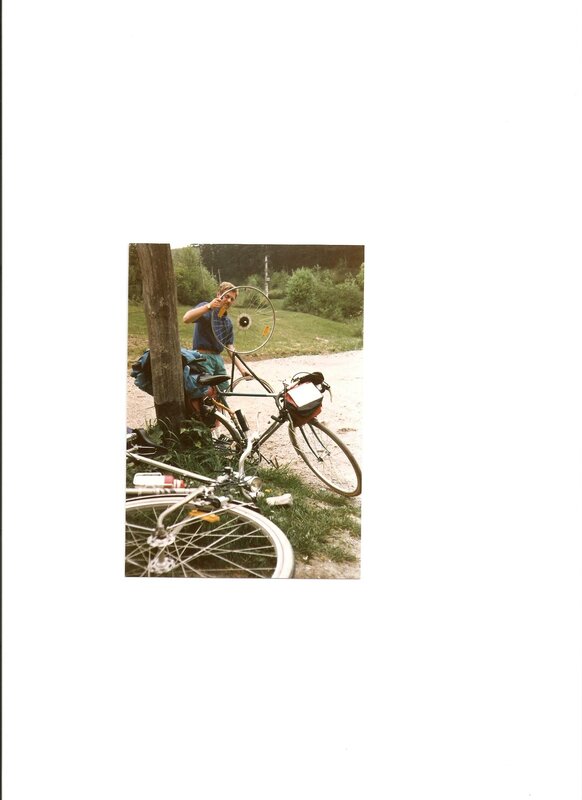 I persuaded a friend of mine from (West)germany to do something rare, discovering Transylvania with a bicycle during the regim of Ceauşescu. Days ahead we sent our bikes to Biharkeresztes, the last town before the border. We spent the night there and started our tour next morning. As I stopped at a food store before the border and bought bread, cheese etc., Franz was surprised and looked at me strange. Later we made a use of them, there was no food store in the small villages not to mention the stock of them, if there was a single store in the village at all. We did not go to the big town Nagyvarad /Oradea in, where lots of shops were, but turned to the North in the outskirts. 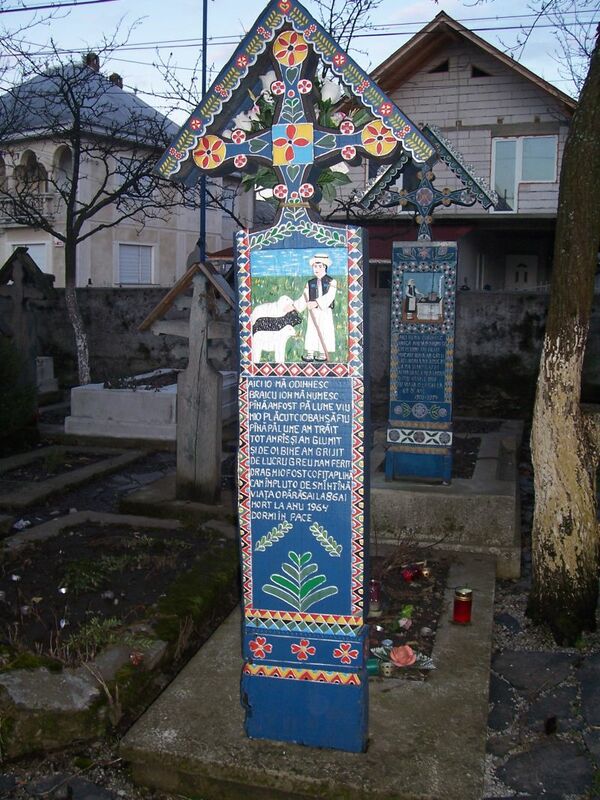 Biharpüspöki (Episcopia Bihorului),Bihar (Biharia), Paptamási (Tămăşeu ), Biharfélegyháza , Jankafalva, Kágya,Székelyhíd (Săcueni) , Margitta (Marghita ). In Margitta we spent the night at a camping. In the evening I tried the half filled thermal basin of the camp site..
After Érszőlős, Csány I went off from the main road to Sződdemeternek (Săuca ), where the birth house of the poet Kölcsey Ferenc (author of the Hungarian national anthem ) stood. We turned to Tăşnad, Nagykároly (Carei ) at ( Căvaş ) and went to Érmindszent (Ady Endre ). We visited the museum of the great hungarian poet. 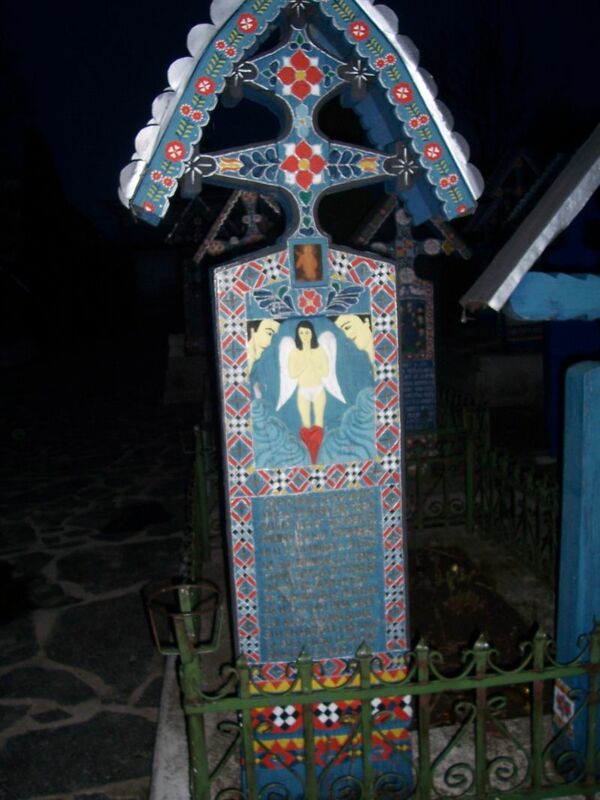 After the town of Nagykároly (Carei) cycled by the plane of Majtény. The Hungarians know this name from the history, because the troups of the War of Independence led by Rákóczi surrended the weapons to the Habsburgs here. 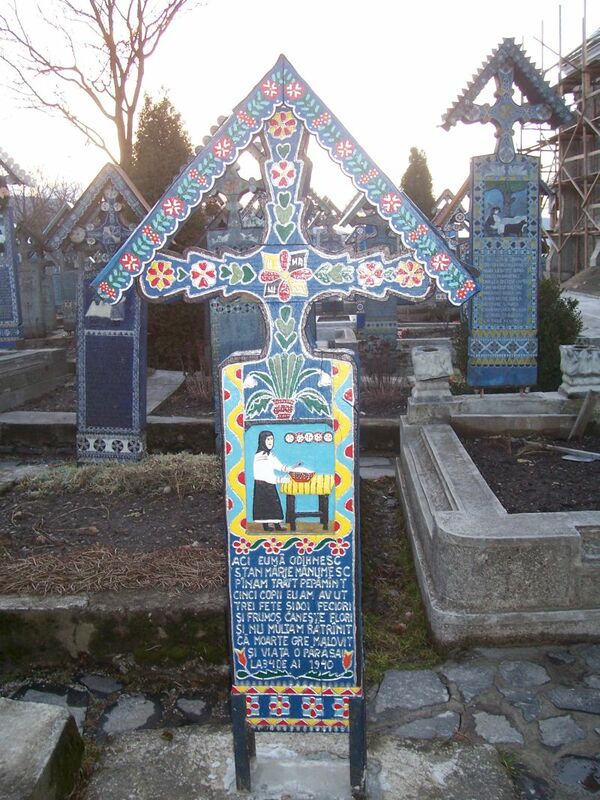 We made a brief sightseeing in the town Szatmárnémeti (Satu Mare) and slept at the camp site. After Sárköz (Liovada) we turned off from the country road toKányaháza, to see the water reservoir . Around the lake started to build a real resort with lots of houses. At Bikszádfürdő we kam back to the country road and climbed to the first pass Huta (587m). We rolled downhill to Técső. (Tecea Mic= Samll, because the genuine big one is laying on the right bank of the Tisza river. I sah the Tisza river through the wire of the frontier. On the opposite bank of the river children were bathing. I could understand their Hungarian langauge conversation from this bank. I was very surprised, because I did not lear at school that so many Hungarian are living in the area, even in the Ukraine. we reached Szaplonca(Săpinţa)where one of my greatest experience was waiting for me. Along the main road of the village we sah Romanian women spinning, waewing, making embroidery, in a court yard we could even see wool colouring (tinting) in a huge kettle. 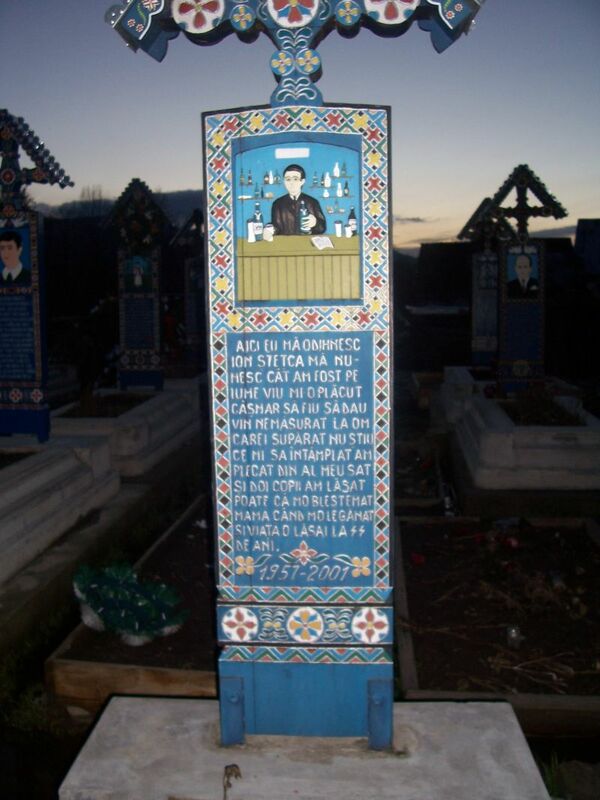 We should not miss to see "merry cementary " . 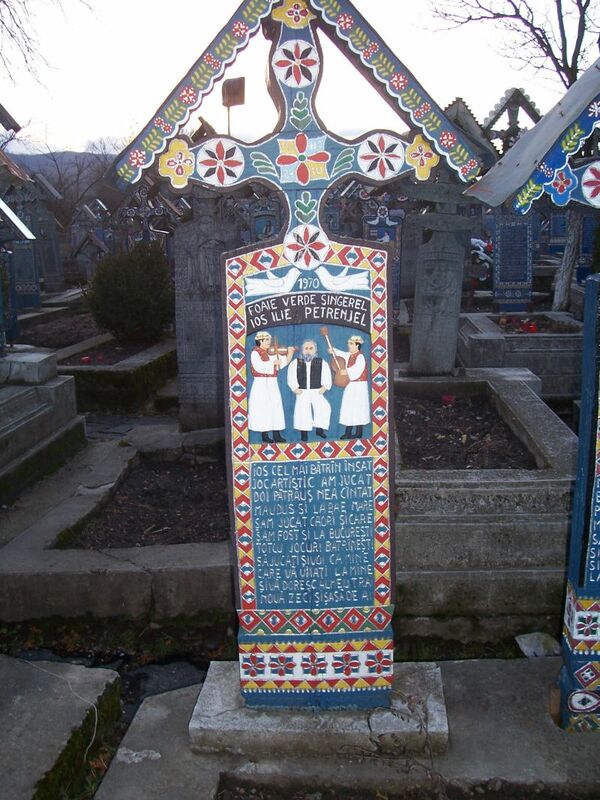 On the wooden crosses - probably only here in the whole world - the painter represented the profession or a characteristic scene out of the life of passed away person in compagnion of merry text on colourfull paintings . These photos were shot 19 years later f.e. the lover keeping wife , but reproduse the atmosphere well. In the settlement Izsaszacsal (Săcel )we turned to the South in direction of the at 818 m laying pass Setref (Şetref). In wonderful sunshine , half undressed I climbed to the pass. While I often look to the side and back enjoying the view of the white snow covered peaks glittering in May. The long downhill ride to the Naszád(Nasaud )valley was also fun. Meanwhile we had some rrefreshment. nsead of the booked (?! ) Hotel we chose the bank of the Kis-Szamos (Someş) river for our tent. On the main square of (Dés (Dej) we watched the vivid trafic ( people walking by as in a big city ) from the first confectionery we sah during our tour . In Szamosújvár (Gerlea ) we slept at a camp site, but this time in a bungalow. We went in separate ways from here. Franz went to Cluj( Kolozsvár, Klausenbug), to visit a German museum. I cycled to Szék(Sic) on a side road. From this village famous for traditional folkklor I went on a sandy path over the hills to Boncida(Bonţida). Thre I was accepted by a group of Gipsy children and the miserable sight of the mansion. The meeting point was in front of the museum. From there we cycled to Zilah (Zalau) via Bács, Vista. After Vista we went on side road via Gorbó to Egres(Aghireşu ). Before we arrived to Egres we pitched up our tent along the roasd und slept there. In Egeres ( ) we asked the people queing up , what are they waiting for. The answer was: we are waiting to get a milk coupon. With this milk coupon we are coming back around 2 p.m. to que up again for the milk itself. This was already the area of Kalotaszeg which is well known by the Hungarians as a Hungarian folkklore region. After Jegenye ( ) Franz repared a flat tyre . Then we climbed up to the danach kletterten to the national road between Cluj and Oradea. Our way lead to Kőrösfő( ). As we rolled downhill to Bánfyhunyad (Huedin) we were caught by rain. Then we decided to stay in the hotel of the town, though it was first noon..
Next day we bekame witnesses of "goose driving" in the valley of Almás-creek. 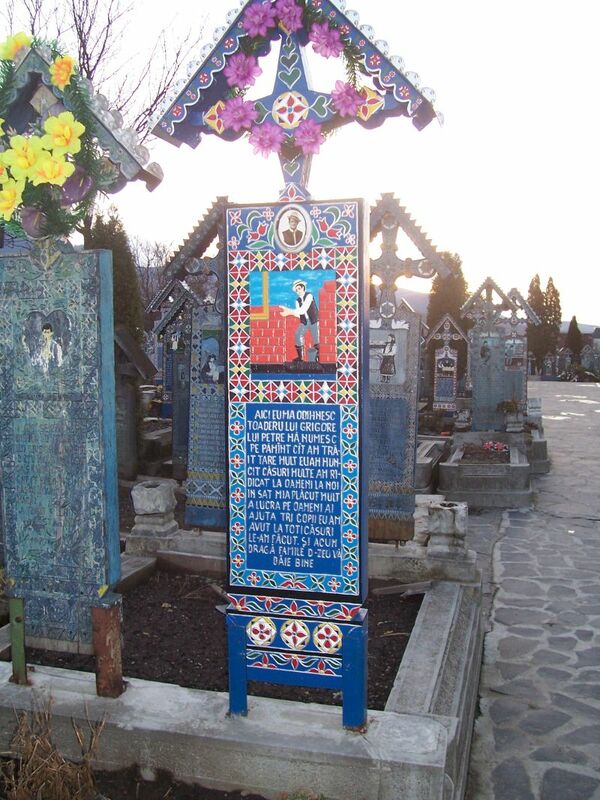 We fouond such wooden headboards in the Hungarian cementrary. After Meszes-Pass we quickly arrived to Zilah(Zalău). Via Szilágysomlyó (Şimleu Silvanei) came to the camping site of Bagos(Boghiş). Next day we crossed the flat, bare and windy mountain of Szes (Muntele Seş). We left Élesd ( Alesd) behind us and pitched up our tent between Örvénd and Telegd, but this time a few hundred m away from the busy national road on a pasture. Our last day ended wiithout any probem according to the flat profile of the road. Finally we reached Szolnok. I was not able to persuade Franz to cycle 100 km more. Instead of 1000 km, our bycicle tour distance reached only 900 km . Our bike tour was succsessfuly finieshed at the rail way station of Szolnok.